Osaki OS 4000 Massage Chair Review - Is It Worth Your Money? Osaki OS 4000 Massage Chair Review - Is It Worth Your Money? This page should provide you everything you need to know about the Osaki OS-4000 massage chair, including some of the most common concerns and commonly asked questions about this product. We'll also be trying to answer the vital question of whether or not this particular massage chair is worth the price, or not. You will find, if you've read or are going to read other reviews of this particular massage chair, that the information provided is menial at best. Apart from that, we'll be continuously updating this page with any changes or updates to the product as they emerge. As the new technology is inevitably developed, we'll be seeing many advancements in the massage chair arena, and it's an exciting area to keep tabs on. Are There Any Problems With The OS-4000 Model? The Osaka OS-4000 is one of the most popular massage chairs on the market, and for good reason, it's well designed, competitively priced (you can pay a LOT more for similar massage chairs from other brands such as Panasonic) and has a good array of features that will accommodate to the needs of most people. It's also a massage chair that's very much suitable for a variety of different settings, and not simply limited to personal use. It's been found to be well fitted to commercial environments too, where other massage chairs simply wouldn't provide “the goods”. As we'll see more closely in the detailed main features section, this chair includes some excellent functionality for the price, and it's really quite competitively priced when you look at the specs overall compared to other similar models from other companies. For a start, the use of its airbag technology, means that the chair is able to mimic the feel of a real masseur, and their ability to provide a sensitive touch based on what's required for each patient. This feature also works to reduce the amount of “gravitational pressure” on the users back which helps to create a state of deeper relaxation. Not only that, but the incredible technology of built in with the body scan feature, allows for higher levels of personalization, which is crucial in determining the quality of massage that can be provided by the massage chair. We'll take a look at these features and more, as we move further down the page. The latest in technology allows for the built in body scan software/hardware to accurately map the user's back curvature. This basically allows the OS-4000 to provide a more precise massage, and hopefully this translates to more relaxation, greater recovery and greater healing from the use of this chair. When the auto scan control button is pushed, the automatic scan is activated, and the chair will position the rollers according to the user's height. Once the auto scan has completed you'll be alerted by a “beep” and then you are able to make some slight adjustments in backrest position. Similarly to the body scan feature of this chair, the S-Track system means that the chair is designed to specifically fit the users back shape with greater accuracy and efficiency, which means a better overall performance with more healing results. The S-Track design allows the OS 4000 Zero Gravity to contour a variety of different spine shapes, and is one of it's more popular features. 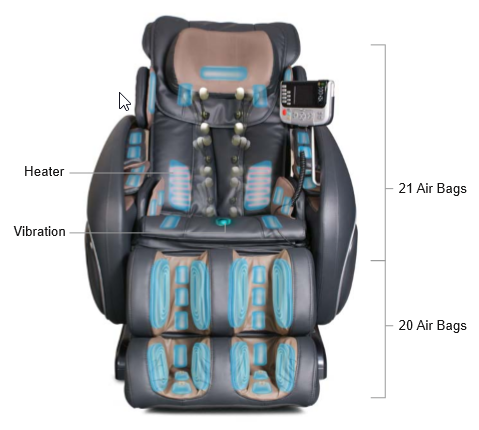 The OS-4000's airbag technology allows the chair to provide a varied amount of massage pressure to the arms, calfs, feet, and shoulders. The previous versions of this model had a greater number of airbags integrated into the design, with as many as 48 total airbags built into the OS-4000 at one stage. However the latest model, which is the model we're looking at here, has got it down to just 38 total airbags, and they have improved the power efficiency, materials and pressurization ability of these airbags to make them perform better, and create a smoother massage experience. One of the hyped features of the OS-4000 is its Zero Gravity. But what does this actually do, and why is it such a big deal? Zero Gravity refers to the idea which apparently NASA discovered, and has since been applied to a few different technologies. Without going to in depth into Zero Gravity's overall theory here, the basic idea is that when the body is in a certain position (feet higher than heart, and a certain torso to leg angle), with the overall goal being to reduce compressional forces exerted on the spine. Now, whether or not this is still applicable for human beings who are using a massage chair, compared to astronauts who are dealing with extreme forces of gravity, is really hard to say. It may simply be just more marketing hype, but it may also have something behind it. In either way, the position of the chair when lying back is said to be very comfortable by most users, with some customers stating that the Zero Gravity position adds an extra level of comfort to the chair's position. The lumbar heating for the OS-4000 is positioned in the lower back area, as you can see from the image here. There is no heating provided for the feet massage area, as you might expect from anything more affordable than a higher range massage chair. There are 2 separate heater units, which are positioned on either side of the lower back. The wireless controller allows for easier control of the chair when in different positions, such as when lying back whilst the chair is in Zero Gravity. The wireless controller doesn't allow for full functionality of the chair though, for all functions you'll have to rely on the main computer controller which is “wired in” to the chair itself, and is seen above on the right hand side. The auto leg scan feature allows the OS-4000 to work out the leg length of each user, and adjust itself accordingly. As stated elsewhere in this review, generally speaking if you're of the height range of somewhere in between 4 feet, 8 inches and 6 feet, 3 inches approximately, you shouldn't have any issues being too big and your legs not fitting properly when using this chair. Generally speaking the overall customer feedback for the OS-4000 is really good, with most people who purchased it giving praise for this model. The chair has overall received a mid 4/5 star rating in most places, and is a serious contender for those looking for a mid to lower range massage chair. Note – Don't always just assume that high rated amazon products are necessarily high quality, sometimes you'll find that there are lots of unverified purchaser reviews. You want to make sure you're buying a product that has legitimate reviews only. You can quite easily tell this by clicking the link that says “See all verified purchase reviews” and making sure there are a good number of reviews listed underneath. People are generally pretty happy with the variety of massage options in terms of different levels of intensity and different types of massage, although just a couple of reviewers thought that the intensity of the back roller could be a little harder, compared with previous massage chairs they had experienced. People who's tried many other different ways to improve their ability to relax and get relief from various ailments claim that this chair has in some cases had more impact than anything else. One lady in particular who reviewed it, said that it allowed her to deal with her Fibromyalgia and joint pain much better. Another customer said it helped her deal with her MS symptoms. Whilst these kinds of chairs are not meant to treat any specific ailments, based on the anecdotal reports, they've definitely been a very valuable addition to many people's lifestyle and relaxation regime. It's worth keeping in mind when choosing this chair or any other model though, that massage chairs are not therapeutic devices, but are meant to be used as relaxation and “pleasure” devices (that sounds a little weird 😀 but I hope you will get what I'm saying). Some users mentioned this, and also made it clear to remind others that these chairs when used inappropriately, could actually aggravate such conditions as a bad back, etc. So it's important to take this seriously, these massage chairs are not toys. As mentioned elsewhere on this page, the Zero Gravity feature of the OS-4000 is well received, and one of the key features that's used in the marketing of this chair. Reading through many of the reviews, you'll find that this is a popular feature as it adds greatly to the chair's comfort. The main problems that people seemed to list for this model Osaki were that it should have come pre-assembled, and that it's heavy and the manual that comes with the chair is not of the best quality. That being said, I think expecting a chair like this to come pre-assembled is a little silly myself, and the issues with the manual were for most reviewers something that wasn't too big a deal, and they were able to work around pretty easily. Also for your information, you can find the a PDF version of the User Manual Here. Other than what we just discussed about the manual not being of the greatest quality (again you can find the PDF version of the manual for the OS-4000 here), the other issues that have been found with the OS-4000 are that some people may find the back rollers to have too low an intensity for their personal preference. This really does depend on preference though, as some other feedback from users stated that they were glad the OS-4000 wasn't too powerful in that area, as it could be a little too intense. Other than that, the unit does at various points in the massage setup process use a beeping noise, to indicate various things (for example when you are using the auto scanner, it will beep to let you know that you can now adjust the back position to your preference). Again, it's a problem for some, but really for most people this wasn't even an issue, and not something that needed mentioning. There are a few different options if you're looking to purchase online. The price doesn't vary too much really, so It's worth choosing a solid vendor and a reliable online ecommerce setup that will look after you in terms of ongoing customer satisfaction if you have any issues. There are a few smaller type websites that you might want to look into yourself, though really the obvious choice for purchase here is Amazon.com. With all the safety and security that Amazon provide the buyer, it's always one of the best choices you can make. What About The Warranty For The OS-4000? The warranty for this product is pretty good, as Osaki provide a full 3 year warranty, and reportedly unlike some other brands and models, this warranty is valid despite WHERE the chair is used, as in the setting – it can be both used domestically and commercially and is still covered by the warranty. This is a big perk for the OS-4000. The warranty is broken down into 3 parts, 1st year breakdowns will be covered by in home service, 2nd year warranty covers parts, and in the 3rd year, the warranty covers the frame/structure. How Is This Chair To Sit On When Not In Operation, Is It A Comfortable Chair In Itself? According to some re-sellers of this model Osaki, this chair is not as comfortable as a dedicated recliner when it's not in operation, but it's not as hard (uncomfortable) as a rocker either. So it comes somewhere in between recliner and rocker. 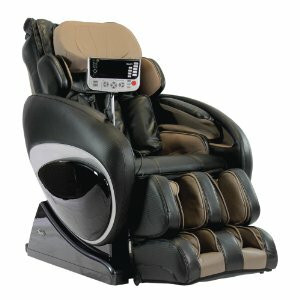 How Does The Foot Massager Work On The OS-4000 Model, Is It A Roller System? The OS-4000 uses a combination of air pressure and specifically posited nodes to massage the user's feet. It does not use a roller system like some other massage chairs on the market. For those who are not going to be satisfied with this setup, they would be best to look at the next model up, the OS-4000T, which is the next model up in terms of price point, and includes what are known as Kneading foot rollers as part of it's design. Does the OS-4000 massage the glutes or only the back? The chair is primarily used for the back, although it definitely works the lower back as one of it's main areas of focus. It also has a “powerful vibration massage for the buttocks”, and a vibration seat massage as well. But honestly the chair does not include a true glute massage feature, as you will need a chair that's considered an “L track” extended roller massage chair. Some examples of massage chairs in this category would be the Ininity Iyashi, the Titan TP-Pro Alpine, or the Titan TP-8400. How much room is needed for the OS-4000 when it's reclined in Zero Gravity mode? Roughly 6.5 Feet, and you will want to position it at least 3 feet from the wall where it's placed. One supplier said that the 4000 was best positioned with approximately 16-18 inches of space behind the chair to allow for a full recline into Zero Gravity mode. What's the maximum weight that this chair will allow for? It's been stated by a few different resellers of the OS-4000, that the maximum weight comes somewhere between 230-265 pounds, which is approximately 105-120 Kilograms. For an exact weight allowance for this model, it's suggested to phone the manufacturer directly. What is the maximum height that this chair will allow for? Approximately 6 Foot and 3 Inches. Where is the Osaki OS-4000 made? These chairs like many, are manufactured in China. Does the OS 4000 include foot rollers? No, it uses an air bag system, that incorporates bumps or “nodes”, but no actual foot roller integration. You'll probably have to go a model up if you want this feature. The OS-4000T may be a suitable option for you. Does this chair need to be assembled on purchase? In most cases yes it does, unless you bought it locally for example. Most resellers state that the assembly process is relatively quick, and can usually be achieved in under 30 minutes. This obvoiusly depends on the situation, if you are trying to assemble it alone or have help, etc. Be aware that some of the parts are quite heavy, so it may be much wiser and easier to have someone who can help you with the process. There will also likely be a lot of cardboard and plastic packaging that you'll have to dispose of. Is the Osaki OS-4000 massage chair FDA approved? Seeing as the chair is not a medical device or treatment, it has no need to be FDA approved. So the answer is no. How many amps (power required) are needed to run this chair? While we couldn't find any specific answer to this (although most likely it will be stated either directly on the chair itself, somewhere near the power supply pack or in the user manual), users have stated that they have been able to run many household appliances normally at the same time as using the chair. Yes, it does. The heater is situated in the lower lumbar area of the chair, and is said to at least heat the lower/mid back areas well, with some people stating that it heats the entire back. How many airbags does the OS-4000 model have? As of writing there are said to be a total of 38 air bags on this model. It used to be 48, but the chair's design has since been upgraded to lower the amount of overall airbags, but make them more efficient and improve their placement. This upgrade to the design also improves the chair in other ways, there is less noise, and the power consumption is lowered too. I don't want to, or can't buy online? Where can I try an OS-4000 in store? This will depend on your location entirely, and therefore is beyond the scope of information we can provide you on this page. However, a good suggestion might be to enter into Google something like “Osaki massage chair supplier __YOUR CLOSEST MAJOR TOWN OR CITY__”. This should help you find the nearest instore provider. Does the OS 4000 provide a heater function in the foot area? No it doesn't, you'll likely need to go with a higher priced model if you want that kind of feature. Does installation/assembly come included in the price? In most cases, no. But depending on the supplier you go with (either via amazon.com or other) you may be able to order what's called a “white glove” service at an additional charge, which will take care of the installation and removal of all packaging, etc. That being said, many users have noted that the instructions for assembly are pretty straight forward, as long as you do indeed follow the instructions in their correct order and don't try to skip ahead at any stages. The rollers on the OS-4000 are completely adjustable, and their are 6 different modes available (from very light and relaxed, up to intense massage), which vary in intensity, meaning that the chair is most likely to cater to most people's different tastes. Generally speaking, the concensus among consumers is that the Osaki rollers are not that intense compared to other brands. What is the fully reclined length of the Osaki OS 4000? 76 inches (or 1.93 meters) when fully reclined. Can the shoulder pads on this model be widened? Firstly, you will void the warranty if you mess with the chair outside of the manufacturers recommendations. Having said that, there are some reports of users who had an issue with the shoulder width of the chair and did some DIY work to drill holes into the chair, in order to widen the position of the shoulder pads. This is not recommended though. If you want a wider chair, you might like to take a look at the Osaki OS-7200H. The chair ships in 2 separate boxes so that in most cases you can easily get the chair through smaller doors and then assemble it once all parts are inside. Is it possible for someone to be too short for this chair? While we could find no direct quotes in terms of minimum height for this chair, anecdotal reports from other users of the chair suggest that it's suitable for people as short as 4 feet, 8 inches approximately. Does this chair have any sort of child lock safety feature included? No it doesn't. The best solution would be to remove the power chord if you're concerned about kids playing on it unsupervised. Is the OS-4000 made of real leather? This model is made from synthetic leather. The reason this material has been used is because synthetic leather is actually more durable where there's a lot of movement in the chair. It's also stated that synthetic leather is easier to clean. What are the assembled measurements for the Osaki OS-4000 model? They are stated in the basic product specs, which can be found on this page here. How much power does the OS-4000 use? The RPC (rated power consumption) for this particular model is 250 watts, according to Osaki. Is the only difference between the Osaki OS-4000 and Osaki OS-4000 C the colour? That's correct, the “C” in the Osaki OS-4000 C stands for “Cream” as in the colour similar to beige. It's stated that the maximum run time per session for the OS-4000 is 30 mins, but can I run it again right after a session ends? It would be wise to allow at least 15 minutes, to 30 minutes for the unit to cool down after you have run a session, in order to avoid any problems associated with over heating. Overall the Osaki OS-4000 is an excellent option for many people who are looking for a lower to mid range massage chair that is feature rich, and provides some excellent features to keep you nicely happy and relaxed. The Zero Gravity allows for one of the most relaxing positions available whilst receiving your massage, and features like the automatic scan, auto leg scan and adjustment, and lower lumbar heating add to the overall experience and create an excellent sensory combination to help you achieve those deep blissful levels of relaxation that you're after. Whilst the chair may not have such features as rollers in the foot massage section, or feet heaters, you'll be hard pressed to find a massage chair within this price range that includes those features and provides them with any level of quality workmanship. Check Amazon's Current Price For The OS 4000 Here! When you look at some of the competing chairs, such as Panasonic's EP MA73, which sells for roughly 3 times the price of the OS-4000, you can see that Osaki have really packed in a lot of great features and made them available to those on a tighter budget. Apart from the minor gripes that some users had with the operation/assembly manual (which we've provided links to here for the PDF version, and having looked over it can't see any major issues) and the fact that the chair doesn't come pre-assembled, which I find to be a little unrealistic honestly, this chair wins in all the main areas. Overall, the Osaki OS-4000 with it's ability to relax users with a wide range of different programs and state of the art technological features makes it an excellent choice for those looking for a solid massage chair in the lower to mid range. For a massage chair in this price range it's a very good choice for most people. Product Description: The Osaki OS 4000 is one of the most popular massage chairs from Osaki. It's priced within an affordable range, so that even consumers who don't want to spend the upper limits of what's possible when it comes to purchasing a massage chair still have the option of a great, highly featured chair. The reviews for this chair suggest that it makes an excellent choice.